It was suited for our brand new operation; we 'opened the box' and implemented it from scratch and did not have to sunset older systems and replace with Workday Financial Management. This was well-suited for this. The cloud functionality was a core requirement for the organization, we did not need a Cadillac with all of the trimmings, we moved relatively quickly and installed. We specically wanted a cloud financial management system that we could use in China and communicate reports to the headquarters organization and roll-up reporting. It performs well. It was reasonably priced since we are not a for-profit company and need the Workday flexibility for finance and accounting operations. Most of our requirements are met with this one system. The system worked efficiently with the additional security we built on to keep confidential. Many reports are ready off-the-shelf or easy to develop, which is a strength. We were surprised by the lack of user guides and supporting information for day-to-day users. Granted, we could find this, but our users like guides. The system could improve with contact help and chat functions if you need the answers quickly. We figured this would all have been built in. Quite surprised by the lack of treasury management functionality. SAP and Oracle have it, although their modules are not that comprehensive or user friendly. The Adaptive Suite is well-rounded. We love the add-on OfficeConnect because it allows us to quickly pull data from Adaptive in a report format. Once you set up the OfficeConnect, it's as easy as pushing a button to re-run. This has been especially helpful for month-end reporting and reconciling data in the Budget. We previously only used Excel for budgeting and reporting. 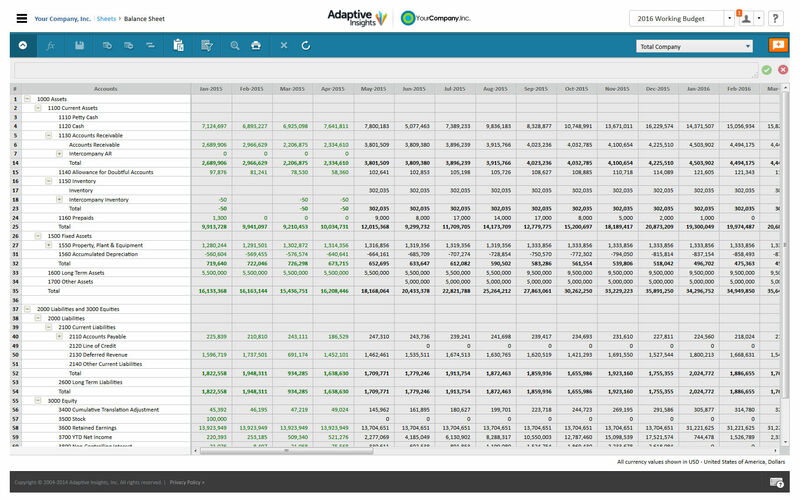 We now use Adaptive for all budgeting and use an add-on product called Office Connect to build reports that automate our data each month. We find the Office Connect reporting a little more user-friendly than the in-house reporting feature. Stacking up it was a faster and more inexpensive implementation. Granted it was still early in the system development years, but the results and the five years of using it speak for themselves. Cloud we wanted, comprehensive financials was a core functional requirement and this was met - it would have taken much longer to implement Workday's competitor systems and we did not have that flexibility. Adding new functionality was relatively painless. As a new starup affiliate five years ago, we did not have a huge budget. The ROI was met relatively quickly, no surprises here. With minimal consulting assistance, this made the implementation cost reasonable, if any software implementation could be considered reasonable. It was a risk to implement Workday Financial Management in one country but we did leverage it with HCM in the states.